Thank you for your interest in supporting Colorado Northwestern's students and programs! Annual Giving: A check or credit card payment given annually to support college programming. The funds can be unrestricted so that they may be used for the greatest need, or designated to a specific program or purpose. Monthly/Quarterly Giving: You can set this kind of gift up as a regular, automatic draw on a bank account or a credit card and you maintain the ability to change the gift at any time. This kind of giving works great for individuals who budget their giving and they like the convenience of automatic payments. Most people are surprised how quickly a $50 per month donation adds up and makes a difference. Long term plans: This can involve everything from estate planning and charitable trusts, to endowments and annuities. All of these plans have tax-saving features, and other features that include financial security in retirement. Talk with your financial planner about which plan would work best for your situation. The bottom line for the CNCC Foundation is that we are grateful that you are considering a gift to the college. Rest assured that your gift will help the college stay strong for the future. If you wish, you can add the following language to your bequest: "I give, devise and bequeath to the Colorado Northwestern Community College Foundation, a nonprofit corporation ("The Foundation") located at 500 Kennedy Drive, Rangely, CO 81648, the following assets: [specific assets, dollar amount, percentage, or residuary] to be used for [the purpose of your choice]." With a bequest of $20,000 or more, you can set up a named endowed fund. Bequests under $20,000 can be added to existing funds. It's that easy! 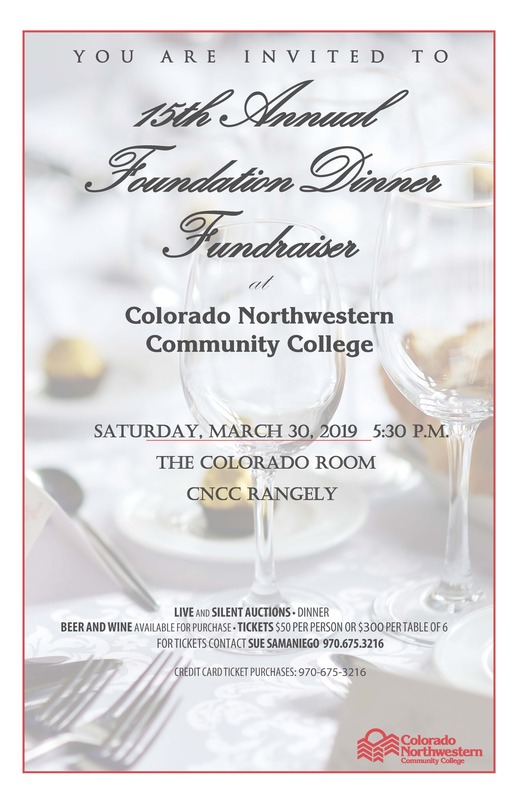 By Check: Please make checks payable to Colorado Northwestern Community College Foundation and send to: CNCC Foundation, 500 Kennedy Drive, Rangely, CO 81648. By Credit Card: Click the Blue "Donate Online Today!" line at the top of the page or call Sue Samaniego, Foundation director at (970) 675-3216. Thank you for supporting Colorado Northwestern Community College!